For the album by Omar Rodríguez-López, see Doom Patrol (album). For the television series, see Doom Patrol (TV series). The Doom Patrol is a superhero team appearing in publications from DC Comics. The original Doom Patrol first appeared in My Greatest Adventure #80 (June 1963), and was created by writers Arnold Drake and Bob Haney, and artist Bruno Premiani. The Doom Patrol has since appeared in multiple incarnations in comics and adapted to other media. Although not one of the most popular superhero teams, they have never been out of print more than a few years since their introduction. The Seventh roster of Doom Patrol, in Doom Patrol #6 (April 2017). From left to right: Terry None, Robot Man, Space Case, Flex Mentallo, Negative Man, Sam Reynolds, Lucius Reynolds, Crazy Jane on the floor on the left. The first Doom Patrol consisted of super-powered misfits whose "gifts" caused them alienation and trauma. Dubbed the "World's Strangest Heroes" (an epithet conceived by editor Murray Boltinoff), the original team included The Chief (Niles Caulder), Robotman (Cliff Steele), Elasti-Girl (Rita Farr), and Negative Man (Larry Trainor). The team remained the featured characters of My Greatest Adventure, which was soon retitled Doom Patrol from issue #86 (March 1964) onwards. The original series was canceled in 1968 when Drake killed the team off in the final issue, Doom Patrol #121 (September–October 1968). Since then, there have been six Doom Patrol series, with Robotman as the only character to appear in all of them. Cover to My Greatest Adventure #80 (June 1963), the first appearance of the Doom Patrol, with art by Bruno Premiani. The Doom Patrol first appeared in 1963, when the DC title My Greatest Adventure, an adventure anthology title, was being converted to a superhero format. The task assigned to writer Arnold Drake was to create a team that fit both of these formats. With fellow writer Bob Haney and artist Bruno Premiani, he created the Doom Patrol, a team of super-powered misfits regarded as freaks by the world at large. According to Drake, editor Murray Boltinoff told him My Greatest Adventure was in danger of cancellation and he wanted him to create a new feature which might save it. Boltinoff was enthusiastic about Drake's initial pitch with Elasti-Girl and Automaton (changed to Robotman by the team's third appearance, issue #82), but Drake wanted a third character and enlisted Haney's help in coming up with Negative Man. The team was initially announced as "The Legion of the Strange". The Doom Patrol feature began in My Greatest Adventure #80, cover dated June 1963. Drake and Haney devised the plot for the issue together, and then each scripted half the issue independently (Drake the first half, Haney the second). Doctor Niles Caulder motivated the original Doom Patrol, bitter from being isolated from the world, to use their powers for the greater good. My Greatest Adventure was officially retitled The Doom Patrol beginning with issue #86. The members of the Doom Patrol often quarreled and suffered personal problems, something that was already common among superhero teams published by Marvel Comics but was novel among the DC lineup. The Doom Patrol's rogues gallery matched the strange, weird tone of the series. Villains included the immortality-seeking General Immortus, the shape-shifting Animal-Vegetable-Mineral Man, and the Brotherhood of Evil led by the Brain, a disembodied brain kept alive by technology. The Brotherhood of Evil also included the intelligent gorilla Monsieur Mallah and Madame Rouge, who was given powers similar to those of Elongated Man, with the extra attribute of a malleable face, allowing her to impersonate various people. Cover to Doom Patrol #121 (September–October 1968), the last original issue of the series, with art by Joe Orlando. The Doom Patrol had two crossovers: one with the Challengers of the Unknown, teaming up to fight Multi-Man and Multi-Woman; and second with the Flash in The Brave and the Bold #65. The popularity of the book waned and the publisher canceled it. Drake killed off the entire Doom Patrol in the final issue, Doom Patrol #121 (September–October 1968). The Doom Patrol sacrificed their lives to Madame Rouge and General Zahl to save the small fishing village of Codsville, Maine. This marked the first time in comic book history that a canceled book ended by having most of its cast of main characters die. Artist Bruno Premiani and editor Murray Boltinoff appeared at the beginning and the end of the story, asking fans to write to DC to resurrect the Doom Patrol, although the latter was supposed to have been Drake. According to the writer, he was replaced with the editor because he had just resigned over a pay dispute and moved to Marvel Comics. He finished the script only out of friendship for Boltinoff. A few years later, three more issues appeared, reprints of earlier issues (#89, #95 and #90 appeared as #122, #123 and #124 respectively). A proper Doom Patrol revival did not occur until 1977, nine years after the original's demise. Some similarities exist between the original Doom Patrol and Marvel Comics' original X-Men. Both include misfit superheroes shunned by society and both are led by men of preternatural intelligence who use wheelchairs. These similarities ultimately led series writer Arnold Drake to argue that the concept of the X-Men must have been based on the Doom Patrol. ...I’ve become more and more convinced that [Stan Lee] knowingly stole The X-Men from The Doom Patrol. Over the years I learned that an awful lot of writers and artists were working surreptitiously between [Marvel and DC]. Therefore from when I first brought the idea into [DC editor] Murray Boltinoff’s office, it would’ve been easy for someone to walk over and hear that [I was] working on a story about a bunch of reluctant superheroes who are led by a man in a wheelchair. So over the years, I began to feel that Stan had more lead time than I realized. He may well have had four, five, or even six months. In an interview shortly before his death in 2007, Drake took a more moderate position, stating that while it is possible Lee took his ideas from Doom Patrol, he could also have arrived at a similar concept independently: "Since we were working in the same vineyards, and if you do enough of that stuff, sooner or later, you will kind of look like you are imitating each other." Writer Paul Kupperberg, a longtime Doom Patrol fan, and artist Joe Staton introduced a new team in Showcase #94 (August–September 1977). DC was then lining up features for the Showcase revival—the series was initially an anthology that would debut new characters who could springboard into their own series if they proved sufficiently popular and Showcase #94 was the first new issue of the series in almost seven years. Editor Paul Levitz instructed Kupperberg and Staton to do a Doom Patrol feature. Kupperberg opted to create a new lineup because he wanted to respect the story in which the Doom Patrol met their deaths, and was inspired by Len Wein and Dave Cockrum's then-recent "all-new, all-different X-Men". Kupperberg has since said he is not proud of the reboot, remarking that "[I was] missing the point of the Doom Patrol. The original group were outsiders and freaks, while my new guys were just comic-book superheroes. I was young and inexperienced and new to writing, with about two years under my belt before getting the gig." The new team is led by Celsius (Arani Desai), the Chief's previously-unseen wife, who recreates the Doom Patrol to protect herself from General Immortus. Robotman is the only survivor of the original Doom Patrol, and his ruined body is replaced by a new, futuristic one built by Dr. Will Magnus. The Negative Spirit now possesses Russian cosmonaut Valentina Vostok, making her Negative Woman (although its presence does not render her radioactive), and she is able to transform her own body into its form rather than sending it out under control. The final member is Tempest aka Joshua Clay, a Vietnam veteran/deserter who fires energy blasts from his hands. This new version of the team did not receive its own series following its three-issue tryout. Kupperberg said this was most likely due to poor sales, as even in the months prior to the DC Implosion he heard no word of a new Doom Patrol series. However, the team did receive a series of guest appearances in various DC titles, such as Superman Family (in a three part arc in the Supergirl feature that was intended for the recently canceled Super-Team Family), DC Comics Presents (teaming up with Superman in a story which revealed that Vostok's powers had changed to match Larry Trainor's exactly), and Supergirl. Robotman also appeared as an occasional supporting character in the Marv Wolfman and George Pérez era of Teen Titans, where it was revealed that Changeling, formerly DP associate Beast Boy, had arranged for Dayton Industries technicians to recreate the Caulder body design for Cliff. His first storyline here had him, the Titans, and a new Brotherhood of Evil battle Madame Rouge and General Zahl, the murderers of the original Doom Patrol, who died in the battle. Eclipse Comics published Doom Patrol: The Official Index with covers drawn by John Byrne in 1984. The two-part series included all of their appearances from My Greatest Adventure #80 to their final appearance before their 1980s return. Kupperberg's enthusiasm for the Doom Patrol remained, and in addition to writing some of the team's post-Showcase appearances, he eventually wrote a proposal for a new Doom Patrol series. The proposal was green-lit, and Kupperberg laid the groundwork for the new series by writing the John Byrne-illustrated Secret Origins Annual #1, published in 1987, which recapped the origins of the two iterations of the Doom Patrol that had existed thus far. In October 1987, DC relaunched Doom Patrol, written by Kupperberg and illustrated by Steve Lightle. Lightle took on the assignment with reluctance, having read and disliked Kupperberg's new Doom Patrol in Showcase #94–96, and soon quit due to several grievances, such as that he was not involved in plotting the comic despite the editor repeatedly promising that he would be. He was replaced by a young Erik Larsen after issue #5. Kupperberg later commented, "I like Erik's work, but I don't think he was exactly right for the Doom Patrol. To tell the truth, I don't think either Erik or myself were happy with the arrangement, but we did our best to make it work." For his part, Larsen said he was perfectly happy on the series, in part because on the few occasions where he disliked an aspect of Kupperberg's plots, he would simply revise the plot when he drew the issue. In retrospect, Larsen felt that this practice was overstepping his bounds, but said the editor never objected to it. This incarnation was a more conventional superhero series than the original volume. It included new members who were hired to the team: the magnetically empowered strong-girl Lodestone (Rhea Jones); Karma (Wayne Hawking), whose psychic power make anyone trying to attack him fall over themselves; and Scott Fischer, whose body generates phenomenal quantities of heat focused through his hands, requiring him to wear protective gloves at all times. A DC Comics Bonus Book appeared in issue #9 (June 1988). According to Kupperberg, sales on the series "started out okay, and descended to the point where I was removed from the book and replaced by Grant Morrison in the hopes he could salvage the title." After the first 18 issues (and various crossovers and annuals), Kupperberg was replaced by Grant Morrison, starting with issue #19. Kupperberg agreed to help Morrison by writing out characters Morrison did not want to use: Celsius and Scott Fischer died before issue #18—Celsius was killed in an explosion in DC Comics' "Invasion!" event, and Scott Fischer (already suffering from a recurrence of childhood leukemia) was the only known active superhero casualty of the Dominators' gene-bomb (also in "Invasion! "); Karma had left the team as he was still on the run from the law (he became a member of the Suicide Squad and died on his first mission with them in the "War of the Gods" crossover event); the Negative Spirit left Negative Woman's body; and Lodestone plunged into a coma, where she would remain for the first half of Morrison's run on the book. Tempest gave up fieldwork to become the team's physician. Conversely, Morrison picked up a throw-away character from DP #14, who was slipped into the art on the last page of #18 to set up Morrison's use: Dorothy Spinner is an ape-faced girl with powerful "imaginary friends." Morrison also substantially retooled Negative Man: Larry Trainor (revealed to be alive in the Kupperburg run, as a prisoner of an underground society but now powerless) is forcibly merged with the Negative Spirit (now a cosmic entity) and a black doctor named Dr. Eleanor Poole, to create a transgender transracial gestalt entity known as Rebis. The new writer introduced some new characters to the team, including the multiple personality-afflicted Crazy Jane and sentient roadway Danny the Street. Morrison used DC's Invasion crossover to restart the book. He incorporated bizarre secret societies, elements of Dada, surrealism, and the cut-up technique pioneered by William S. Burroughs and Brion Gysin. He also borrowed the ideas of Jorge Luis Borges and Heinrich Hoffmann. The original creator, Arnold Drake, said Morrison's was the only subsequent run to reflect the intent of the original series. Cover of Doom Force one-shot, parody of X-Force. Art by Keith Giffen and Mike Mignola. Over the course of the series, Morrison dedicated some issues to parody and homage. Willoughby Kipling led the Doom Patrol on a parody of the Brujería story arc of Swamp Thing: A Murder of Crows in issues #31–32. Issue #42 featured the origin of Flex Mentallo, who was supposed to be the character in the Charles Atlas ad. A belated lawsuit from the Charles Atlas Company showed that DC was protected under Fair Use doctrine in addition to an expired statute of limitations. Issue #53 featured a dream sequence that mimicked the Stan Lee/Jack Kirby Fantastic Four, borrowing plot points both from the Galactus Trilogy (FF #48–50) and FF #51, "This Man, This Monster." Another special called Doom Force was released as a one-shot and was meant to mimic and parody the X-Force book by Rob Liefeld. Issue #45 parodied Marvel's Punisher and Alan Moore in a satire called the Beard Hunter, a perpetually clean-shaven serial killer who murders bearded men and targets the Chief. Red Jack is a near-omnipotent being who thinks he is both Jack the Ripper and God. He lives in a house without windows, torturing butterflies to create the pain he needs to survive. The Brotherhood of Dada are an anarchistic group who fight against reality and reason. It features members such as Sleepwalk, who can only use her tremendous powers when asleep (she takes sleeping pills and listens to Barry Manilow before battles), and The Quiz, who has "every superpower you hadn't thought of" and a pathological fear of dirt. The Scissormen, a race of beings that attack non-fictional beings in the "real world" (i.e., the world the Doom Patrol live in) with their large scissor-like hands and cut people out of reality. In issue #57, it was revealed that the Chief had secretly caused the "accidents" which turned Cliff, Larry Trainor, and Rita Farr into super beings. Chief stated he caused them to gain their powers (or in the case of Robotman, destroyed his original body in order to obtain his brain to put into his robot body) because of his hatred for them. He felt they were spoiled and narcissistic as well as shallow individuals, and that by turning them into "freaks," he could "improve" them as human beings. He further revealed that he lied about not being married to Celsius (the leader of the second Doom Patrol, who Caulder claimed was insane/lying about being married to him) out of anger. He was upset over how the experiments performed on her (like with Elasti-Girl) only gave her super-powers and did not turn her into a freak. When Tempest and Robotman found out his role in "creating" Robotman, Elasti-Girl, and Negative Man, Tempest was killed and Robotman paralyzed. Having been exposed as a villain, Caulder planned to unleash nanobots into the world, hoping to create a catastrophe that would "improve" humanity, regardless of the carnage it would cause. But Caulder's plan was hijacked by the Candlemaker, a violent cosmic horror who is freed by Dorothy in exchange for him resurrecting Tempest (who Candlemaker re-killed). Candlemaker then decapitated Caulder and sought to use the nanobots to enslave humanity. Dorothy, Crazy Jane, and Robotman (freed by the former two) defeated Candlemaker with help from the new reborn version of Rebis. Rebis briefly left the team to mate with a double of himself in order to be "reborn" in a new body as part of a cosmic ritual. However, during the battle, Jane was sent flying into a portal and landed in a world without heroes. Forcibly institutionalized for her mental issues in this new world, the final issue of Morrison's run had Robotman locate Jane as she was about to kill herself and took her to live with Cliff within the confines of Danny the Street. Morrison left the book with issue #63, and Rachel Pollack took over writing the book the next issue. Pollack's first issue was also the first under the new Vertigo imprint of DC Comics (although the trade paperback editions of Morrison's work do bear the imprint, the original issues did not). Returning characters for Rachel Pollack's run included Cliff Steele, Niles Caulder (kept alive by the nanobots, but reduced to a disembodied head, usually kept on a tray filled with ice), and Dorothy Spinner. Pollack's run had Dorothy as a primary member of the Patrol; she brought her imaginary friends to her aid in combat. Overall, Pollack's run dealt with issues such as the generation gap, humanity, identity, transgender issues, bisexuality, and borrowed elements from Judaism and Kabbalah in the last few issues. The angel Akatriel is used as a major character in the last four issues. The first story arc of her run was called "Sliding in the Wreckage". Cliff's computer brain started to malfunction, and he regressed into flashbacks from previous storylines. Dorothy was haunted by African spirits while dealing with living alone in the real world. The Chief was given a new body by Will Magnus, but to atone for his sins, Caulder ripped his head off the body and was kept in cryogenic storage. Meanwhile, the entire Earth had been suffering from random outbreaks of weirdness, contributed by the arrival of something called "The Book of Ice." A government agency known as the Builders, similar to the Men from N.O.W.H.E.R.E., were trying to stop the outbreak, which was apparently linked to a race of shapeshifters known as the Teiresias. As the Chief was kept in a cryogenic state, he appeared in the land of the Teiresias as a face carved in a mountain. They warned him that his arrival in this world was causing the craziness in the real world. Throughout the storyline, little people with backward letters for heads had been seen altering people. These people were apparently older version of nanomachines, referred to as "nannos". At the Doom Patrol headquarters, Builder agents attacked, and in the craziness, two of the Teiresias approached Dorothy with a new brain for Cliff, but to insert it she needed the Chief's expertise. In the Teiresias world, nannos "repaired" the Chief so he could live as a severed head. After his awakening, the craziness seemed to stop, and Dorothy, Cliff, and the Chief each realized that they needed to be together. The team relocated to Violet Valley's Rainbow Estates, a house haunted by ghosts of those who died in sexual accidents. There, three new members joined. The Bandage People, George and Marion, who were once two workers for the Builders but managed to escape; and the Inner Child, a manifestation of the ghosts' purity and innocence. Another later newcomer of the team was Kate Godwin, aka Coagula, one of the first transsexual superheroes. A one-time ally of the team called the Identity Addict, who could become different superheroes by shedding her skin like a lizard, integrated herself back into the team while using the False Memory identity to change the team's memories until she was kicked out by Dorothy. Villains that the team fought, besides the Builders, included the Fox and the Crow, two animal spirits whose feud Dorothy and Cliff were subsequently pulled into; the Master Cleaner, a being with a human fetus inside a bubble for a head who began "cleaning" the world by stripping it down to nothing and replacing the stolen items, including people, with a paper ticket; and a group of Hassidic healers who called themselves the False Healers and their leader, the Rabbi of Darkness. Toward the end of the series, Cliff Steele's brain became entirely robotic, until Dorothy Spinner used her imaginary friends to "repair" it. The Chief would later die after trying to enter the Sephirot or Tree of Life. A new artist, Ted McKeever, took over the artwork for the final 13 issues. Pollack continued writing the title until its cancellation with issue #87, in February 1995. In December 2001, writer John Arcudi and artist Tan Eng Huat launched a new Doom Patrol series. This relaunch was not under the Vertigo imprint and returned the title to the mainstream DC universe. The series lasted for 22 issues. Arcudi's storylines revealed what happened to the previous team. Dorothy Spinner had had a mental breakdown and accidentally killed most of the members still with the team at the end of the Pollack run. She fell into a coma, but subconsciously created a new Robotman, who became a part of a new Doom Patrol. This Doom Patrol was a company-owned team, owned and operated by Thayer Jost and Jost Enterprises for a while before working independently. Apart from Robotman, the team consists of Fast Forward, Kid Slick, Fever, and Freak. The Robotman that Dorothy created faded away when it realized what it actually was, but the other teammates searched for Cliff Steele, who became a member of the Doom Patrol yet again. They found his brain in a desolate area of the Smoky Mountains, buried under the rubble of the campsite where Dorothy's breakdown occurred. A prosthetics expert who had defected from Russia rebuilt Cliff's body. Jost, meanwhile, learned that he could not own the rights to the Doom Patrol, since the man who signed the rights over to him was not actually Cliff Steele. Instead, he tried to obtain guardianship of the brain-dead Dorothy. At the end of the series, Cliff pulled her life support. A separate Doom Patrol operated for some time, working apart and with the team. This secondary group consists of Elongated Man, Metamorpho, Doctor Light, and Beast Boy. Fever later appears in the six-issue limited series Infinite Crisis in a service held for numerous missing and dead heroes. Among the attendees are some of John Byrne's Doom Patrol members. In August 2004, DC launched a new Doom Patrol series after the new team debuted in JLA. John Byrne wrote and illustrated this series, with inks by Doug Hazlewood. Touted as "Together again for the first time! ", Byrne rebooted the series, eliminating all previous Doom Patrol continuity. This series also retroactively eliminated Beast Boy's origins and numerous Doom Patrol appearances in other titles, including the reunions of Beast Boy (then called Changeling) and Robotman in the 1980s New Teen Titans, along with the entire Kupperberg, Morrison, Pollack, and Arcudi incarnations of the team (and their respective new members) along with the rest of the DC Universe's memories of the group. Three new characters—Nudge, Grunt (Henry Bucher), and Vortex—were introduced and utilized throughout the series run. The series debuted as part of a six-part storyline that ran in JLA #94–99 as "The Tenth Circle". Though Byrne was the creative force behind the reboot, the arc that "introduced" the rebooted version of the team was written by Chris Claremont; at the time, DC had retooled JLA into an anthology style book with different creative teams per arc and the Tenth Circle was promoted largely off of the reunion of the two. This reboot was both controversial and short-lived. Besides the removal of the popular Morrison run (and its characters) from canon and the butterfly effect it had on the Teen Titans, the series garnered controversy over a scene where Robotman and Elasti-Girl are sent back in time and inhabit their younger selves' bodies. During their time in the past, Robotman declares his love for Elasti-Girl. However, due to an age gap between the two heroes, Rita is trapped in her twelve-year-old self's body when the adult Cliff reveals his romantic feelings and kisses her. DC canceled Byrne's series with issue #18. The events in DC's Infinite Crisis crossover saw the restoration of the Doom Patrol's full continuity, with the inclusion of all previous incarnations. DC editorial used the events of the Infinite Crisis crossover to restore the Doom Patrol's continuity. In escaping from the paradise dimension they had inhabited since the end of Crisis on Infinite Earths, Superboy-Prime and Alex Luthor created temporal ripples which spread throughout reality, altering certain events, such as restoring Jason Todd to life. In the reprinted edition of Infinite Crisis, additional scenes added to the collection showed Fever, Kid Slick, Ava, Nudge, Grunt, and Vortex among a two-page spread of heroes. While assisting the Teen Titans in battling Superboy-Prime, members of the Doom Patrol had flashbacks to their original history. Robotman and Niles Caulder regained memories of the previous Doom Patrol teams with which they had worked. This battle apparently undid some of Superboy-Prime's timeline changes and resulted in a timeline incorporating all previous incarnations of the Doom Patrol, but with Rita Farr and Larry Trainor still alive. The Chief confirmed that Rita was indeed killed by Zahl's explosion. The Chief claimed that he later found her skull and treated it with synthetic proteins until her malleable body was regrown from it. Steve Dayton is again using the Mento helmet and he is mentally unstable; however, he remembers his time as the Crime Lord. The Chief appears to be manipulating the Doom Patrol members once again; he claims to wish to return them to normal so "maybe one day [they] won't be freaks anymore." After the Doom Patrol encounters the Titans, the Chief tells them that Kid Devil should be a member of the Doom Patrol instead of the Titans, since his unique appearance and nature will always separate him from others. However, Beast Boy, Elasti-Girl, and Mento all stand up to the Chief and force him to step down as the Doom Patrol's leader, with Mento taking over that role. Two former members of the Teen Titans were dramatically altered during the course of the Infinite Crisis. Mal Duncan, now code-named Vox, and his wife (Bumblebee) now reside in the Doom Patrol's castle headquarters. The Doom Patrol later appear in The Four Horsemen series (2007), with Caulder back in charge. According to Titans (vol. 2) #1, Beast Boy has recently become the team leader. In DC Universe: Decisions, Robotman has a supporting role while Mento appears in issue #4. On February 7, 2009, it was announced at the New York Comic Con that Keith Giffen would be spearheading a revival of Doom Patrol, a title which he has long said he wanted to write. He was joined by artist Matt Clark, who has also long expressed a desire to work on the team. The new series focused on the core members Elasti-Girl, Negative Man, Robotman, and the Chief, while other members such as Mento, Bumblebee, and Vox were to be seen later. The title launched with a 10-page ongoing Metal Men co-feature written by J. M. DeMatteis. In the first issue, Rita takes on the alias "Elasti-Woman", and according to the team shrink, she's "mothering" Bumblebee, who's now eight inches tall after being shrunk—rather conveniently for her codename—to the size of a bee in Infinite Crisis. Nudge, Byrne's addition to the team, was killed in the line of duty and Grunt took off with her corpse. The current team is working out of Oolong Island (from 52), which has been turned into a resort town while still maintaining a large super-science background. The Challengers of the Unknown's Rocky Davis is also working closely with the team for spiritual support. Former member Crazy Jane appears in issue #7. Danny the Street, in a reduced aspect, appears in issue #8. Ambush Bug joined the team at the end of issue #9. The series was canceled, due to a decrease in sales, with issue #22 in May 2011. In September 2011, The New 52 rebooted DC's continuity. In this new timeline, the Doom Patrol is briefly mentioned in issue #24 of Justice League. The team is depicted to be identical in appearance to Paul Kupperberg's 1977 Doom Patrol, consisting of members Celsius, Joshua Clay, and Negative Woman, with additional members Karma and Scott Fischer. During the Forever Evil storyline, Valentina Vostok, Karma, and Scott are killed during a confrontation with Johnny Quick and Atomica of the Crime Syndicate, while Celsius and Joshua Clay are presumably killed. Upon learning of his team's demise, Doctor Niles Caulder sets about assembling a new Doom Patrol. Following the defeat of the Crime Syndicate, the newly created Doom Patrol is introduced in issue #30 of Justice League. The team includes Robotman, Elasti-Girl, Negative Man and M.I.A. Justice League member Element Woman, whom Caulder refuses to let leave the group and tricks into thinking she was abandoned by the Justice League. The team attempt to capture Jessica Cruz, the new Power Ring, to force her to join the team. During their attempt to capture her, Caulder demands the team refuse to save civilians in a collapsing building to allow him to lobotomize Cruz and force her to serve him. The Justice League save the people in the building and Lex Luthor manages to hold Caulder back so Batman can convince Cruz to go with the League instead. During their fight, Luthor reveals that Caulder (as he did in the Morrison run) was responsible for causing the "accidents" that gave the Doom Patrol their powers and that both Celsius and Joshua Clay used the chaos of the events of Forever Evil to fake their deaths and escape from Caulder. It is also revealed that Caulder poisoned an entire fishing village as part of an experiment, and cured the residents only after Luthor discovered the truth and threatened to expose him. A new Doom Patrol series written by Gerard Way and drawn by Nick Derington was created as part of the Young Animal imprint. The first issue was published on September 14, 2016. The series has created a multitude of original characters as well as some taken from former team rosters. Casey Brinke, a fictional character that Danny The Street created in order to communicate with people through comic books, was contacted by Danny when he became threatened by a group of aliens known as Vectra. They wished to profit from his power to create life by turning his fictional people into cheap meat at a fast food restaurant. Danny reached out to Casey, hoping that she could find and join the Doom Patrol after explaining her origin story, both the fictional origin story he had created for her and how she had become a real person. Casey agreed to help. She piloted Danny, currently taking the form of an ambulance, into his attackers' headquarters, discovering that the leader of the organization was none other than her fictional father Torminox, accidentally brought to life when Vectra had tortured Danny. Alongside Torminox was an evil version of Casey, known as Doodle Bug. She was also created when Danny was tortured and reflects his concern regarding how Casey would become in the real world. Despite the family drama, Casey and the Doom Patrol defeated Vectra and freed Danny from Vectra's clutches. Afterward, the team sets out to find Crazy Jane, who was running a cult under the influence of her current dominant ego Dr. Harrison. Harrison wished to purge the 63 other personalities within Jane's mind by distributing them among the mind-controlled cult members using a gene bomb. After the process, she would kill them all. Jane and the team managed to stop this plan and save the cult members while also killing the Dr. Harrison personality within Jane. The team is contacted by Niles Caulder in a later issue and embark on a mission with him leading. The mission goes haywire and it is revealed that Niles Caulder is gambling again, leading the team to evict him as a leader and as a member of the team. This marks the team embracing being a new iteration of the Doom Patrol. In 1997, DC released the Tangent Comics series of books, built on the premise of a world that diverged from the mainstream following the events of the Cuban Missile Crisis. The series featured characters with the same names as mainstream DC characters but were otherwise unrelated to them. The series included a one-shot Doom Patrol title. This Doom Patrol consisted of four heroes: Doomsday, Star Sapphire, Firehawk, and Rampage. The heroes traveled back in time from 2030 to 1997 to prevent Earth's destruction. The Tangent books were later integrated into the DC Multiverse (as Earth-9) as part of the events of Infinite Crisis. An omnibus collecting the entire run was also released. Issues #122–124 of Doom Patrol are reprinted material. Of the 87 issues in the Paul Kupperberg/Grant Morrison/Rachel Pollack run, only #19–63 (Grant Morrison's run) had been reprinted, aside from one issue of Kupperberg's run. Kupperberg's run will be reprinted in an omnibus edition in 2019. A collected edition of Rachel Pollack's run was announced in May 2017, with a 2018 release date, but was cancelled in November 2017  with no explanation given. None of Doom Patrol Volume 3 or 4's issues have been collected. A third collection, titled Fire Away containing issues #14–22, was originally scheduled but never released. The sixth volume of Doom Patrol is published under DC's Young Animal Imprint. In the fifth season of the animated series Teen Titans, the Doom Patrol plays a significant role in the two-part episode "Homecoming" (2005). The lineup consisted of Mento (voiced by Xander Berkeley), Negative Man (Judge Reinhold), Robotman (Peter Onorati), and Elasti-Girl (Tara Strong). The Chief did not appear and Mento was portrayed as the team leader. A flashback reveals Beast Boy's Doom Patrol days, where it is clear that Mento and Elasti-Girl are his parental figures (Robin later comments that the team essentially raised Beast Boy). During the flashback, Beast Boy must choose between destroying the Brotherhood of Evil's black-hole weapon or saving his teammates. Doing the latter earns him a reprimand from Mento. In the present, the Doom Patrol is captured by the Brotherhood of Evil, save for a deactivated Robotman (who was hung on a tree as a warning to intruders). A device containing a message from Mento makes its way to Beast Boy, allowing him and the Teen Titans to rescue the Doom Patrol. Beast Boy is faced with a similar choice as in the flashback and again elects to save his friends. This time, however, the Brotherhood of Evil escape, poised to use a new black-hole weapon. Both teams ultimately foil the Brotherhood's plot, with the Doom Patrol expressing pride in their former member. 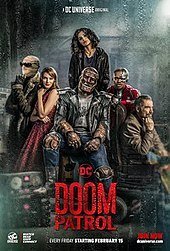 Though the Doom Patrol make no further appearances, the Brotherhood of Evil reoccur throughout the fifth season in a plot to eliminate all of the world's young heroes. In the episode "Go! ", Beast Boy briefly mentions he used to be on the Doom Patrol. The Doom Patrol appears in the second season of the animated series Batman: The Brave and the Bold, the focus of the episode "The Last Patrol!" (2010). The team is composed of Elasti-Girl, Negative Man, Robotman, and Niles Caulder. The storyline says that the Doom Patrol had disbanded years earlier after failing to save the life of a young woman who was taken hostage by General Zahl during his invasion of Paris. The team is forced to come out of retirement with the help of Batman after Zahl assembles fellow Doom Patrol villains Brain, Monsieur Mallah, the Mutant Trio (Ir, Ur, and Ar), Animal-Vegetable-Mineral Man, and Arsenal (Zahl's bodyguard) to kill them. In an ending mirroring Drake's finale to the original series, the members of the Doom Patrol ultimately sacrifice their lives in order to save the town of Codsville while Batman defeats General Zahl and the other Doom Patrol villains. After this, the people of the world are shown somberly chanting "We're all the Doom Patrol" as even General Zahl mourned their death when he failed to reveal them as "frauds" and making the world love them even more. In memory of the fallen heroes, Codsville's residents renamed the town Four Heroes after them. The Doom Patrol were featured in three of the 155 animated shorts, which highlighted any one of 31 DC characters, produced for DC Nation Shorts (2011–2014). The Doom Patrol episodes, all in 2013, included the Chief as voiced by Jeffrey Combs, Elasti-Girl by Kari Wahlgren, Negative Man by Clancy Brown and Robotman voiced by David Kaye. The Doom Patrol fights different villains including General Immortus (also voiced by Clancy Brown). The Doom Patrol were featured in a segment of Young Justice: Outsiders episode 12 "Nightmare Monkeys" in which the art style was that of Teen Titans Go! with the original cast of Teen Titans Go! voicing the members of the Doom Patrol. They were appropriately called Doom Patrol Go!. With the exception of Mento, it was revealed that the actual Doom Patrol died during a mission. In 2018, the Doom Patrol appeared in the fourth episode of the live action Titans, the inaugural television web series on the DC Universe streaming service. The episode, entitled "The Doom Patrol", features Bruno Bichir as Niles Caulder, April Bowlby as Elasti-Girl, Brendan Fraser as Robotman, and Dwain Murphy as Negative Man. Following the team's 2018 appearance in Titans, it returned with its own Doom Patrol series on the same DC Universe streaming service in 2019. It was confirmed that the group would include at least Robotman (played by Brendan Fraser), Negative Man (played by Matt Bomer), Elasti-Woman (played by April Bowlby), Crazy Jane (played by Diane Guerrero), leader Dr. Niles Caulder (played by Timothy Dalton), and that they would be organized at the behest of Cyborg (Joivan Wade). Additionally, an older incarnation of the Doom Patrol also appear in the series. Their team, formerly active in the 1950s, appear in the sixth episode and included Niles Caulder, Joshua Clay, Steve Dayton, Arani Desai and Rhea Jones. In a battle against Mr. Nobody, the latter three are rendered insane and Joshua Clay becomes their caretaker, while Niles abandons the group. The current group meet them on the behest of Mr. Nobody himself. The original Doom Patrol had one cameo appearance in the animated film Justice League: The New Frontier. Variety reported on July 19, 2006 that Warner Bros. has hired Adam Turner to pen a screenplay to bring Doom Patrol to the big screen. However, as of 2018[update], no director, cast, or release date has been announced. It is assumed this was scrapped in favor of the DC Universe show. ^ a b c Beatty, Scott (2008). "Doom Patrol". In Dougall, Alastair. The DC Comics Encyclopedia. New York: Dorling Kindersley. p. 109. ISBN 0-7566-4119-5. OCLC 213309017. ^ a b c d e f Browning, Michael (July 2013). "The Doom Patrol Interviews: Arnold Drake". Back Issue!. Raleigh, North Carolina: TwoMorrows Publishing (65): 38–41. ^ Guay, George, "The Life and Death of the Doom Patrol," Amazing Heroes #6, November 1981, Zam, Inc., Stamford, CT, p. 47 (footnote). ^ a b c d e f g Browning, Michael (July 2013). "The Doom Patrol Interviews: Paul Kupperberg". Back Issue!. Raleigh, North Carolina: TwoMorrows Publishing (65): 42–45. ^ Johnson, Dan (April 2014). "Showcase Presents... Again". Back Issue!. Raleigh, North Carolina: TwoMorrows Publishing (71): 50–51. ^ Irvine, Alex (2008). "Doom Patrol". In Dougall, Alastair. The Vertigo Encyclopedia. New York: Dorling Kindersley. pp. 61–63. ISBN 0-7566-4122-5. OCLC 213309015. ^ Manning, Matthew K. "1980s" in Dolan, p. 229: "October  saw a new Doom Patrol series, by writer Paul Kupperberg and artist Steve Lightle." ^ Browning, Michael (July 2013). "The Doom Patrol Interviews: Steve Lightle". Back Issue!. Raleigh, North Carolina: TwoMorrows Publishing (65): 46–51. ^ Browning, Michael (July 2013). "The Doom Patrol Interviews: Erik Larsen". Back Issue!. Raleigh, North Carolina: TwoMorrows Publishing (65): 52–54. ^ Johnston, Rich (2007-03-12). "I Hardly Knew You". Lying in the Gutters. Comic Book Resources. Retrieved 2007-04-03. ^ Sullivan, John (August 31, 2000). "Charles Atlas Complaint Held as Legal Weakling". The New York Times. ^ "John Byrne Reboots the Doom Patrol: Writing and Penciling New Issue Due Out in June," ICv2 (March 12, 2004). ^ Tipton, Scott. "Comics 101: Gloom and Doom," Archived July 7, 2011, at the Wayback Machine Movie Poop-Shoot (July 7, 2004). ^ Infinite Crisis Hardcover Edition. ^ Teen Titans vol. 3, #36. ^ a b Way, Gerard (2017). Doom Patrol Vol. 1: Brick by Brick (Young Animal). DC Comics. ISBN 1401269796. ^ *'San Diego Comicon 2005: Teen Titans Behind The Scenes', Titans Tower Archived November 21, 2005, at the Wayback Machine (July 19, 2005). Retrieved July 27, 2005. ^ "Superhero Shows: First Look at Doom Patrol and Animal Man, Citizens of DC Nation". superheroshows.blogspot.co.uk. March 22, 2012. Retrieved August 5, 2018. ^ Ridgely, Charlie (February 9, 2018). "Doom Patrol Confirmed for 'Titans' TV Series". Comicbook.com. Retrieved February 10, 2018. ^ Petski, Denise (February 15, 2018). "Titans: Bruno Bichir Cast As The Chief In DC Live-Action Series". Deadline.com. Retrieved February 15, 2018. ^ Petski, Denise (May 14, 2018). "'Doom Patrol' Live-Action Drama Series From Greg Berlanti Greenlighted By DC Universe". Deadline Hollywood. Retrieved May 14, 2018. ^ Andreeva, Nellie (August 21, 2018). "'Doom Patrol': Brendan Fraser To Star As Robotman In DC Universe TV Series". ^ tonyschaab (2019-03-21). "Photos, Video, And Synopsis For This Week's Episode Of 'Doom Patrol: Doom Patrol Patrol'". ScienceFiction.com. Retrieved 2019-03-23. Doom Patrol at Don Markstein's Toonopedia. Archived from the original on April 22, 2016. Khouri, Andy (July 9, 2007). "Grant Morrison: The Early Years – Part III: "Doom Patrol"". ComicBookResources.com. Archived from the original on April 22, 2016. Retrieved April 22, 2016.